Type “funny forklift accidents” into any search engine and you will be rewarded with hours of free entertainment. The only reason these accidents are “funny” is because the viewer is not involved in the incident or because they did not result in the death of the operator. They do, however, serve a useful purpose. Funny forklift videos show the magnitude of what can go wrong in terms of personal injury and damage. Every three days, someone in the United States dies as the result of a forklift accident. Below you will learn the most important safety tips for forklift drivers, and the one tip that can make the most difference: forklift training. Even at low speeds, a forklift is capable of inflicting damage or causing a serious injury or even death. Simple measures like wearing seat belts, observing stop signs and speed limits and sounding a horn approaching blind spots can go a long way toward maintaining a safe working environment. Other measures, like keeping hands and feet contained within the overhead guard of the forklift and remaining inside the truck in the event of a tip over are less obvious. This is why it’s essential to apply rigorous safety tips for forklifts and to take forklift safety devices seriously. Forklift accidents aren’t as uncommon as you may think. There are many factors in a workplace that can increase the chance of accidents occurring. Forklift overturning – Forklifts are notoriously unstable, especially when carrying a load. A forklift should be driven with the load tilted back and no more than six to eight inches off the ground. If you are driving a sit-down type forklift that starts to overturn, ignore your instinct to jump off and get out of the way. Stay with the truck, hold on tight and lean the other way. A pedestrian is hit by a forklift – Where possible, pedestrians and forklifts should be kept well separated. Every effort should be made to alert pedestrians when a forklift is nearby; use the horn, flashing lights, and back-up alarms. Someone falls off a forklift – Avoid this by always wearing your seatbelt and never, ever, carry passengers. 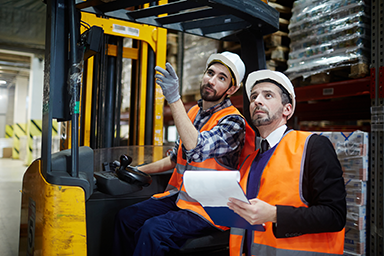 Lack of operator training – Workers who do not have their forklift certification aren’t prepared to recognize hazards that can cause accidents. They are much more likely to be involved in an accident that affects them, and other nearby workers. Driving forklifts at too high of speeds – Drivers often cannot brake in time to avoid other workers and vehicles. Speeding can also cause tip-overs and collisions. Lack of proper tools – Operating a forklift without the right tools, attachments, and accessories may not equip operators with the ability to respond to situations and tasks. Poor maintenance – Not checking forklifts each day for any signs of maintenance needs and repairs can lead to serious problems down the line, like accidents. Avoiding a forklift accident comes down to three main forklift safety tips. These include inspecting the equipment before each shift, following proper operational practices, and safe load handling. The pre-operation of forklifts involves a pre-start inspection that checks the condition of the vehicle, fluid levels, tires, fork condition, forklift safety devices, finger guards, load backrest extension and more with the power off. The operational inspection goes over the brakes, steering, drive controls, tilt control, hoist and lowering control, attachment control, horn, lights, and alarms with the engine on. Forklifts must also be properly maintained according to the manufacturer’s instructions. To prevent accidents, forklift operators need to make sure to drive the lift at proper speeds at all time, be careful when rounding corners and approaching blind spots, and to always wear the proper safety clothing and equipment. Knowing how to operate a forklift safely comes with proper training through a recognized and OSHA-compliant program. When handling loads, forklift operators must be aware of off-center loads, overloading, and damaged or loose loads. Operators need to be careful when approaching loads, using the proper mast position, and the fork position. The most important safety device on your lift truck is a properly trained operator. The right training can help with each of these safety practices and act as the most effective way to prevent injuries and fatalities with forklifts. The foregoing is for guidance only and is not intended to be a substitute for proper OSHA-compliant training. While forklift fatalities are at a 40 year low, employers should still make sure their workers have a proper certification and the common sense to be safe. According to OSHA, all forklift operators must have forklift training to properly operate the equipment and be safe on the job. The forklift training from CertifyMe.net covers all the requirements set by OSHA, including all necessary topics to equip workers with everything they need to drive forklifts safely. Our online course can be accessed from any device with an internet connection, and completed in only about one hour. Once workers have completed their training, they will be 100% OSHA-compliant and equipped with all the most important forklift safety tips.